This HUGE Auction includes contents of Antique Store! 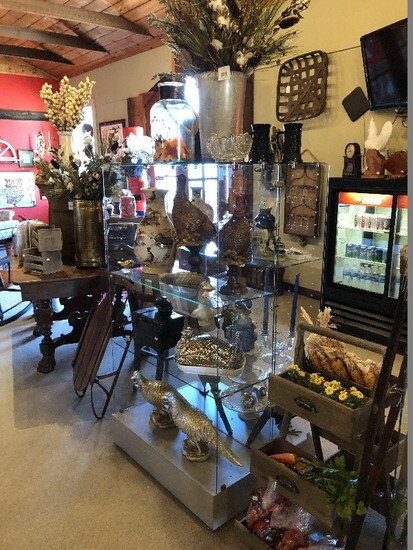 Including Ceramic and Porcelain Vases, Decorative Bird Decor, Wallo Decor, Antique Vegetable Stands, Glass Display Cases, AND SO MUCH MORE! Payment Instructions: ALL INVOICES TO BE CHARGED TO CREDIT/DEBIT CARD ON FILE AT END OF AUCTION, UNLESS PRIOR ARRANGEMENTS HAVE BEEN MADE W/ WHAM. IF CC DECLINES AFTER (3) ATTEMPTS, ITEMS WILL BE SOLD & PROCEEDS WILL GO TO WHAM FOR STORAGE FEES. Shipping Instructions: WHAM will use UPS to ship items other than large furniture. We have a local shipper for that. UPS will charge $3 to pick up your items plus shipping fees. Any coins or Jewelry there will be no pick up charge. Checkout Date & Times: Please be on time for this auction pickup at 601 S Howard Ave, Landrum, SC, 29356 on Friday March 1st, 2019 - from 11am - 2pm Bring packing material. WHAM will provide movers during the pick-up time only. PLEASE READ ALL TERMS & CONDITIONS BEFORE BIDDING! All items will be sold at online auction only. All items are sold 'as is, where is' & ALL sales are FINAL! There are NO warranties or guarantees expressed or implied on any of the merchandise. Bidders are given ample time to preview items, but in the event that they cannot preview, they are buying at their own risk! Invoices will be sent to all winning bidders the morning following each auction. A 15% buyer's premium will be added to all purchased lots. Invoices are to be paid within 24 hours following the close of the auction per Payment Instructions. Items to be shipped will be subject to 'Shipper's Instructions' per our information page. Specific questions concerning auction, please contact WHAM at 864-801-9468. 1 - Items need to be picked up on the designated day at the designated time. We are on a limited time frame dictated by our clients. 2 - "Local Pickup" Items will NOT be shipped! These are usually large lots, so please allow time to load and bring help. Lots will be forfeited if not picked up at designated time. 3 - Items to be shipped will be subject to "Shippers Instructions". 4 - Small Items not picked up during checkout will be brought to WHAM Showroom. It is the bidder's responsibility to arrange pick up and pay any and all handling fees. Large Items (Furniture) will be brought back to WHAM Showroom & CC on file will be charged a moving fee of $25 per item and for small items there will be a $5 charge. You've been outbid to c****4! to YOU! You've been outbid to L****m! to YOU! Unique Rustic Metal Antlers Wall Décor Accent by Shea's Wildflower Co.
You've been outbid to P****1! to YOU! You've been outbid to p****4! to YOU! Will Rogers Print w/ Quote "Everybody is Ignorant, Only on Different Subjects"
You've been outbid to G****0! to YOU! You've been outbid to L****S! to YOU! You've been outbid to l****r! to YOU! You've been outbid to o****5! to YOU! You've been outbid to w****7! to YOU!